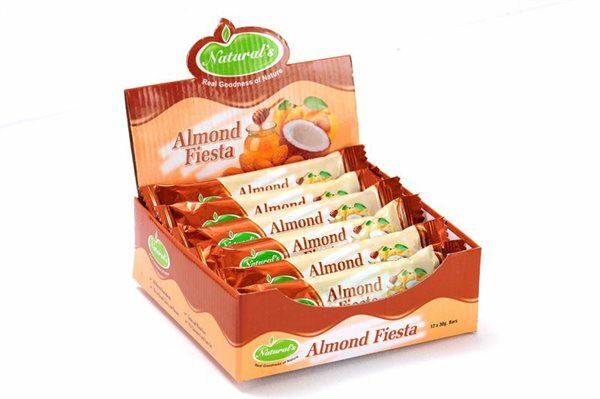 Natural’s Almond Fiesta bar is Packed with whole premium almonds, which are high in protein, fiber, calcium, magnesium, potassium, vitamin E, and other antioxidants. Almonds help prevent osteoporosis and have properties that regulate blood pressure. In addition, coconut improves digestive functions and Honey can be a powerful immune system booster. Honey’s antioxidant and anti-bacterial properties can help improve digestive system and help you stay healthy and fight disease With the taste of a macaroon more than that of a nutrition bar, Natural’s Almond Fiesta Bar will satisfy even the pickiest sweet tooth. Rich in protein, Destroying intestinal parasites, Boost immune system. Natural source of carbohydrates, Boost performance and endurance, Antioxidant and Anti-bacterial properties.